Relationships: Various rare pairings/OT15. Pairings are tagged exhaustively, though there doesn't seem to be an option for gen in the tags. Warnings: Sexual and/or suggestive situations. Language. Mentions of drug use. Body image issues. Religious discussions. Summary: Every member has his own quirks. Even in intimacy. Especially in intimacy. 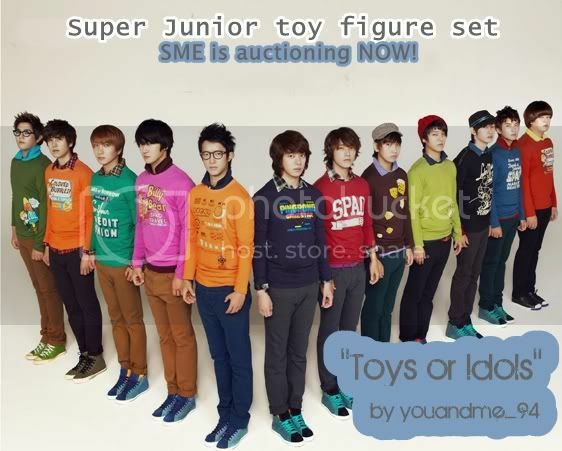 A collection of vignettes about Super Junior members. A.N. : Pairings, ratings, and summaries can be found within individual chapters. summary: we are super junior. a/n: wrote this a while back. posting it here because idk, i kind of like it. A/N: This was posted last year Jan 2011... I just wanted to share it since... well, yeah... I dunno... be the judge.. I hope my usage of words (especially regarding with Henry and Zhoumi) didn't offend any fans or anyone. I did my best to be careful of how I will present this to you. "...A bow isn’t only done to thank someone. It isn’t only done when showing respect or to acknowledge people… For Leeteuk it carries a much deeper meaning…"
dicks, which were still hard. Hankyung laughed and said that he was. TITLE: Who tops 'em all? pairing/character : Friendship!KyuMin , Super Junior OT13? Summary: In which all 18 boys have super powers, and are forced to learn to use them to defend themselves when a powerful enemy kidaps some of their own. Being a teenager has never been this hard. Disclaimer: I don't own the characters nor the concept of the powers. I also realise other writers may have had the same type of story before; please rest assured that I'm not trying to plagiarise your ideas! A/N: this is a new mutant power series that I'm currently writing. I've also written a few related oneshots earlier. Summary: When Umma Leetuek and Appa Kangin decide to go on a little vacation. Title: those who wander 1/? Summary: Kyuhyun is on a mission, of sorts, and it takes him places he never would have considered. AU Action/Adventure. A/N: yeah if you read some of this before it's been heavily, HEAVILY edited and new parts have been added, so it warrants another read or you'll be lost later. Gonna post a new chap about every two weeks or so, and it's gonna be a long haul. Concrit completely welcomed. General Summary: School is one of the most common places to fall in love in. And also to get your heart broken in. Chapter Summary: Eunhyuk finally confesses to Donghae. Then it occurred to Eeteuk that he too, was not a virgin, and he sighed. Chapter Summary: Han Geng starts to have second thoughts about the boy he hated a few days ago. Guilt and sadness washed over him as his mind went back to that night. The night that spoiled everything between them. “And if you don’t let go of them, I’ll drown her right here.” Sungmin states calmly, and Junsu finds himself shivering even though he knows that it’s all a bluff, because Sungmin could never kill a person, much less a younger girl. Chapter Summary: Who's the person that caught Eunhyuk's eye? Summary : Making something to eat has never before been such an adventure. Summary: Little snapshots of moments shared by the members over the car ride. A/N: This is a fanfic I did for a contest awhile back. You can read it here in its original posting. It’s just not the same is it? Chapter Summary: Was Yesung victorious after all? “Friend of yours?” Heechul asked Kangin with a sly smile.